Memories of Fine Summers at FCW. Finavon Castle Water has a reputation for night fishing for sea trout. The pictures in this section show how in low water, when many rivers are unproductive, the pools with their long tails provide an idyllic setting for fly fishing through the night. Milton Beat FCW. The pools in this photograph contain sea trout, often in considerable numbers, from the middle of June through to mid August. 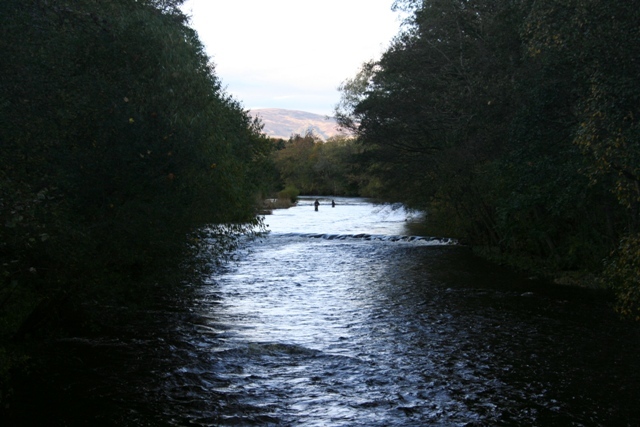 The level of the river in this picture is perfect for night sea trout fishing. The long days and dusky nights, when it never gets truly dark, of late May, June and July, are the setting for thrills of big fish (as opposed to the sight or sound of a splash in daylight!) moving close to the surface, sometimes only feet away from the wading angler. Quiet ripples against your legs as you wade sometimes reveal the whereabouts of a shoal of sea trout. 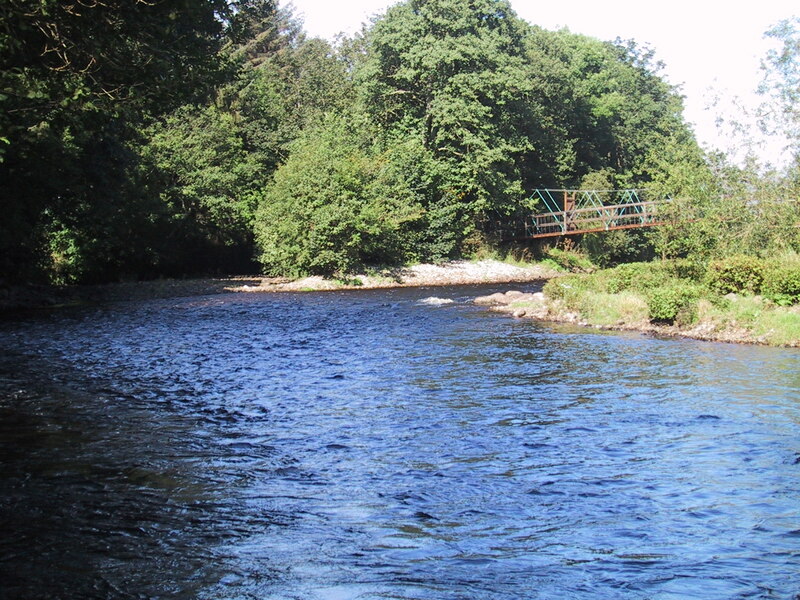 On other occasions you hear soft swirling splooshes beneath the overhanging branches of the opposite bank, and sometimes a sea trout will leap clean out of the water, re-entering the river with a loud splash, shattering the still night. Scudding clouds, starlit nights, stoneflies on the warmest nights crwaling over your face and naked arms, the continuous moving shadows, sounds of birds and fauna above the cello sounds of the river at night. That is night fishing. It twangs the pre-historic hunter in you and reminds you of the people of Finavon Hill two thousand years ago, who fished these very pools, albeit with spear, trap and net. This view of the head of Tyndals Pool with ‘the armchair rock’ (ACR) is well known to people who fish at Finavon because this is the view monitored by the live webcam on the FCW website. In this photo the river is at low summer level: the measure is that there is very little, if any, water betweeen the ‘ACR’ and the left bank. Fishing quietly at night, while blending into the natural environment, gets you very close to wild creatures such as otters, who sometimes surface inside a rod’s length from where you are wading, shocking you by expelling air from their nostrils with a soft snort. They are efficient thieves and will nick any fish you may have left on the bank to pick up later and take home to eat. Nowadays we don’t kill any sea trout, because they are in a low numbers phase of their natural abundance cycle, or perhaps there are other problems of their survival yet to be identified. 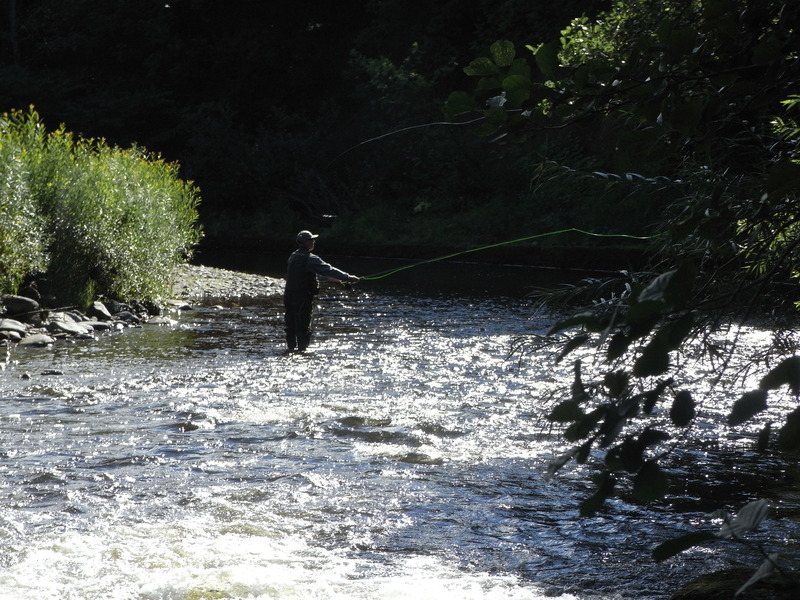 The fisherman in this photo is fishing the head stream of the Red Brae, opposite the confluence with the Lemno Burn. In past years I used to check the numbers of salmon and sea trout in the Red Brae during periods of low water by beaming a powerful spotlight onto this stream. On many occasions I have seen and counted MSW salmon and sea trout in numbers exceeding 50 – all in this short stretch of streamy water. In the light of the lamp they appear like airships as they hold station in the clear water. The stream in the photo is always a potential taking place for both species. Sometimes, usually on a half-moonlit night, you can establish an absurd conversation with tawny owls – if you are a bit of a mimic, and prepared to embarrass yourself and anyone else in the vicinity. One night a few years ago I managed to gather a whole family of tawnies around me as I quietly (while noisily hooting of course!) waded down Upper Boat Pool. I could distinguish between members of the family by the tone, structure and duration of their hooting. Some of them were very close to me, and must have seen me and realised it was a member of the species Homo Sapiens, and not another tawny, doing the hooting. I think they were playing with me, or maybe they just thought I was an Alpha male tawny! Low water in mid summer at FCW. This is the view looking upstream in Craigo Stream towards the suspension bridge. Behind you in the photo is the comfortable and atmospheric Red Brae Hut with its wooden cut outs of big salmon and sea trout, with the name of the fishereman, the date, the fly and the pool. This is the place to be atr 4 o’clock on a July morning, while the human world is asleep and the natural world at its most active, innocent and approachable. Heaven! Perfect fins, a hard & muscular body and unmistakeable tail shape of a fresh run sea trout. In fact this fish was caught in salt water in Orkney. Sea trout fishing at night is pure magic. 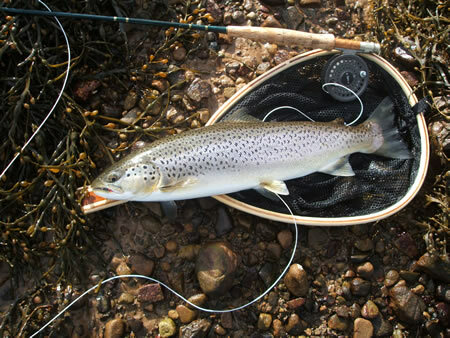 There aren’t many places where you can do it, and Finavon is among the best – when the sea trout are ‘in’ of course. Mixed Stocks Fisheries. The Lairds of our Coast and wild salmon. Breath-taking arrogance, unsustainable, out-of-date, and cause for international censure. After years of abuse of the netting slap periods, Usan Fisheries have at last been brought to account. To anyone concerned about the state of salmon and sea trout stocks on the east coast of Scotland, they will feel that this legal action is long overdue. Sailing close to the wind. Did Usan jibe? It is widely recognised by everyone involved in salmon fishery management that the activities of the Usan Salmon Fishery have at times been somewhat ‘close to the wind’ in terms of the law. The weekly slap times, when nets are by law supposed to be rendered inactive by removing the leaders to the bag nets, are in place to support the conservation of salmon, grilse and sea trout. They are most certainly not regulations for a pick and choose approach by Usan Fisheries, arguably the most destructive mixed stocks fishery remaining in the UK. The owners of the Usan Salmon Fisheries company now face 12 charges relating to alleged incidents in Angus and Fife during August and September 2013. The locations cited are at Boddin, Dysart, Ethie Haven and Scurdie Ness. If it transpires that their nets were operating in the month of September it will confirm the extraordinary arrogance – some might say the behaviour of people who seem to regard the Scottish coast as their fiefdom, and all salmon as their property – of a fishery which surely is now an anachronism, putting Scotland’s inept management of its wild salmon into international pariah status. The fact is that September is outwith the netting season. Transgression of statutory season closures is surely tantamount to poaching? Of the twelve charges, five are related to netting salmon every weeekend in August from 1800 on Fridays to 0600 on Mondays, all outwith the statutory weekly close time for net fisheries. All this may seem petty and somewhat arcane to anyone unfamiliar with the operations of Usan Salmon Fisheries. This company, which has long received political and moral support from government and funding from the EU, takes salmon in unknown numbers from most, if not all, east coast salmon rivers. 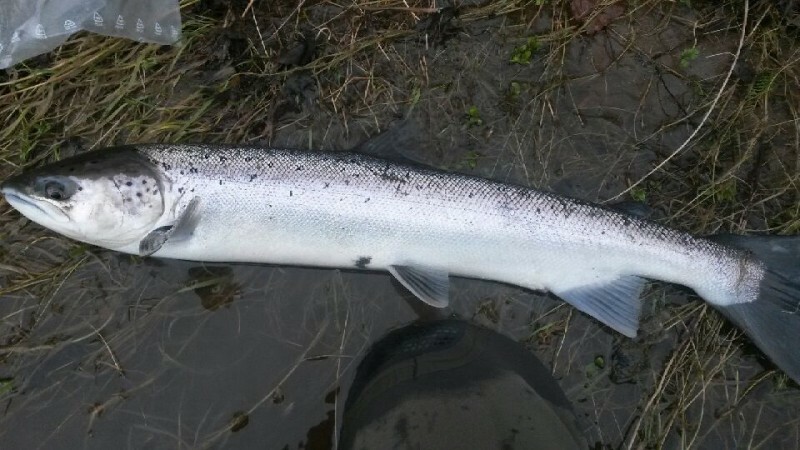 No-one knows which populations of fish are being exploited, some of which may be in a fragile condition (as is the case with the government’s own assessment of South Esk spring salmon). 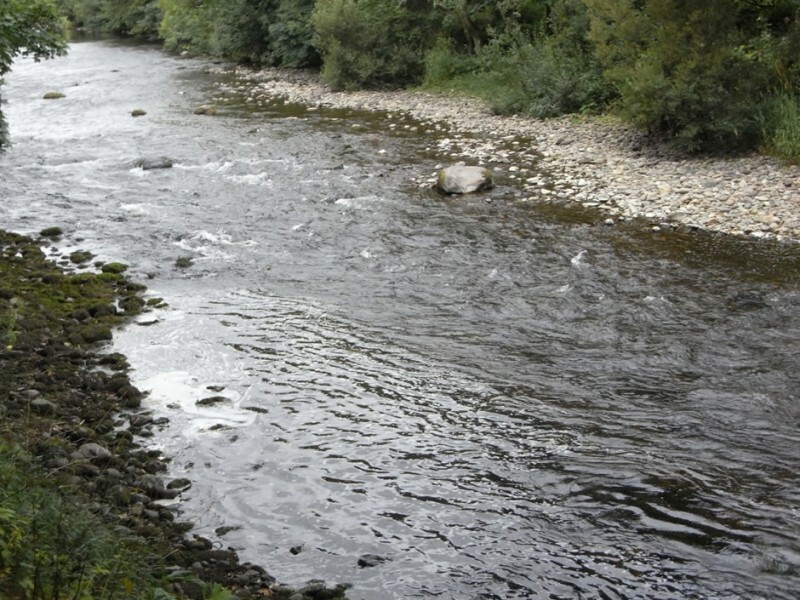 The activities of Usan Salmon Fisheries make it impossible for fishery managers on all affected rivers to assess the condition of their salmon stocks. The existence of that mixed stocks net fishery is simply bad fishery management, and it is time to take full control of their exploitation. If it is found that they have been flouting the law, notwithstanding health and safety considerations, it will become absolutely clear that they cannot be trusted to manage their operations within the law. Appropriate measures to curb their activities, on conservation grounds alone, must surely follow? And I haven’t even touched on the immense damage being done by one small family business to the rural economy and communities from Fife to Inverness!